What is the best tricks I have taught him: To bite my grandfather’s socks! Do you know who loves me? 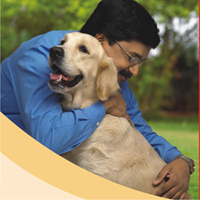 Dr KG Umesh: Just like us, adult dogs need a balanced diet which contains the right amount of protein, fat, carbohydrates, many different vitamins and minerals to ensure that they stay in peak condition and maintain optimal health. The nutritional profile of any diet-including homemade diets-depends on how the recipe was formulated, the nutrient content of the ingredients, and how you prepare the diet. Unless properly formulated by a nutritionist or a vet, diets made at home are not likely to be nutritionally complete and balanced (deficient, excessive or unbalanced in essential nutrients). Prepared pet foods from reputable pet food manufacturers like Pedigree come with a guarantee of nutritional adequacy, quality and safety. They also contain adequate level of zinc and fats to keep skin and hair coat healthy. There is no need to feed any supplements like calcium or vitamins while he is feeding on balanced food like pedigree except clean fresh water. Therefore continue feeding only recommended quantity of the prepared petfood. Dr KG Umesh: Skin problems are common in dogs as their skin is thin and the barrier function is poor, compared to man or other animals. Growing puppies are generally susceptible to nutritional and parasitic skin diseases like demodicosis. Any dog with chronic or recurring skin disease must be subjected to investigations like skin scraping or blood tests to find the underlying cause. Proper nutrition particularly zinc, fats and vitamins can help to strengthen skin barrier function. Please consult your vet at the earliest to identify underlying cause and therefore, the specific treatment. Dr KG Umesh: The Rottweiler is a large intimidating-looking dog with muscular and powerful body. They must be thoroughly socialized at an early age as most Rottweilers are inclined toward dominance/aggression and will test for position in the family pecking order. What is your dog trying to communicate through his barking? He may be barking to express happiness orfear, to get attention, to warn you of an approaching stranger, or to let you know he is bored or lonely. He may also bark to let others know that they are in his territory. Only good training and socialization will mean your dog is able to tell the difference between people allowed into the house and intruders. You may need to get the help of a professional trainer. A dog with good manners will not bark unnecessarily! Dr KG Umesh: A reasonable work-up for paralysis is required with selected tests to identify underlying cause, considering your pet’s age and breed. Radiograph and other imaging tests like CT or MRI are used to rule out prolapsed or herniated disk, fractures, spinal injury, hip joint problems etc. This will help your vet to provide appropriate prognosis and treatment plan based on cause. Some dogs respond well to rest, anti-inflammatory drugs, and pain medication. Your vet may consider surgery when it is appropriate and fit at this stage. Physiotherapy and supportive treatment may benefit until cause is identified or when no underlying problem can be identified. Dr KG Umesh: Small breeds with short hair coat would fit your requirements. You can choose breeds like Pug or Dachshund, Miniature Pinscher, etc which are more manageable. Manufactured pet foods not only provide complete nutrition but are also cheaper compared to home prepared diets. You have to bear Vaccination and other preventive health care cost during first three months of puppy stage and then you need to visit your vet at least twice a year for a routine health check and annual vaccinations. Pets & parasites : Not a good pair! Dr KG Umesh: Any wound that shows poor response to conventional therapy should undergo some basic laboratory tests like biopsy, culture or cytology to find underlying cause. Some common causes are deep pyoderma, sinus, lick granulomas which require aggressive treatment. Please consult your vet who may recommend suitable tests to find specific therapy. Dr KG Umesh: For a basic first aid kit, I would suggest having cotton balls, paracetomol syrup for fever, an antihistamine or steroid ointment in case of an insect bite, Savlon or Betadine liquid to clean out a wound, bandages to make a muzzle and to protect an injured area, balanced oral electrolyte solution to prevent dehydration from vomiting or diarrhoea, and astringent/gauze pads to help stop bleeding. All drugs are dosed in dogs generally on body weight basis and therefore any human medicine can cause serious adverse effects when used inappropriately in dogs. Common poisoning of pets from human medicines includes pain killers, anti-inflammatory drugs (Brufen, Diclofenac), drugs used for hypertension, vitamin D, cardiac drugs, cough syrups and many more. Remember to always phone your veterinarian for advice before you attempt to do anything to help your pet. Dr KG Umesh: There are several known causes of cracked footpads. You will need to take your dog to the vet so he can give your dog a thorough examination and to see what has caused the cracking of his pads. A dog’s paws exposed to irritants, floor cleaning detergents, chemicals or even cold pavement or rough road – all of which cause drying and cracking of the paw pads. Some common medical causes include allergies, chronic yeast infection, autoimmune diseases and nutritional deficiencies. Some dogs develop a condition called digital hyperkeratosis which can only be controlled with topical creams. Meanwhile, try smearing petroleum jelly (Vaseline) or moisturising creams every 4-6 hours. Wrap your pet’s paw after cleaning to prevent infection or dust collecting between cracks and old sock can sometime help. Consider using dog booties. Feed her on complete food like Pedigree to prevent any nutritional deficiency. Dr KG Umesh: The backbone of dogs is made up of bones called vertebrae. These bones protect the spinal cord, which extends from the brain to your pet’s tail. A pad of tough, fibrous tissue called a disc, is located between each vertebra. These intervertebral discs function as shock absorbers and stabilizers of the spine. In chondrodystrophic breeds like yours, the disc undergoes degeneration over time but many changes are present early in life. Disc degeneration is the main cause of the back problem but trauma is also a common cause. Your vet may advice radiograph, spinal tap or even MRI or CT scan to identify cause of back problem. Some dogs respond well to rest, anti-inflammatory drugs, and pain medication. However, some dogs treated with rest and medications have recurrent attacks of back problems. Your veterinarian may recommend surgery if the disease is rapid and severe, if weakness or paralysis is present, or if your pet had repeated attacks. Limiting running and jumping has been suggested to prevent occurrence, but the value of this has not been proven. Feeding balanced food and regular exercise will keep him fit and healthy. Make sure that he is not overweight or obese. Dr KG Umesh: Superficial bacterial infection (pyoderma) is an extremely common presentation in the dog. In the majority of cases, it is caused by Staphylococcus intermedius. Staphylococci are carried on normal dogs at certain body sites. Superficial pyoderma can be follicular or non-follicular. The non-follicular pyoderma (bacterial impetigo) is very common condition in puppies particularly on skin of ventral abdomen/groin region. The development of recurrent pyoderma is most commonly a secondary phenomenon and predisposing factors should be investigated. Any condition that disrupts normal skin barrier function or compromises the immune system may predispose to the development of pyoderma. Some common predisposing causes of impetigo in puppies include unhygienic bedding/floors, urine scald or poor nutrition. Feed him good quality puppy food like Pedigree and keep him clean with antibacterial wash/creams for at least few weeks following complete recovery.